I don’t have a lot of check pieces in my closet. But when I saw this ruffled pencil skirt on Gail of Is This Mutton? I knew it had to be mine. I actually ordered it retail! (similar here). And of course, the doggie print cast cover is the charming finishing piece. By the way, only two more weeks till I get my hardware removed, oh happy day! In the rare event temperatures drop below 90, I am ready with my Trina Turk check jacket (sim). I love how all these black-and-white pieces play together: Skirt, doggie cast-cover, jacket. I’m wearing a gorgeous black bead necklace, created for me by Suzanne Carrillo. The massive vintage cuff is from the Citizen Rosebud shop. That really is a fabulous skirt, I can see why you had to have it. The jacket works so well with it, as does your doggie cast. I bought my daughter a black and white check top with ruffle sleeves today and now I want one so we can match! That is a really darling skirt and I think when an item has so much pizzazz it’s good to pair it with a more understated complimentary piece like the silk tank. However, when you popped on the pattern play with that great little jacket I was even more impressed! I’m glad to hear that the cast has only two more weeks to do its job. Hope you’ve mended good as new! 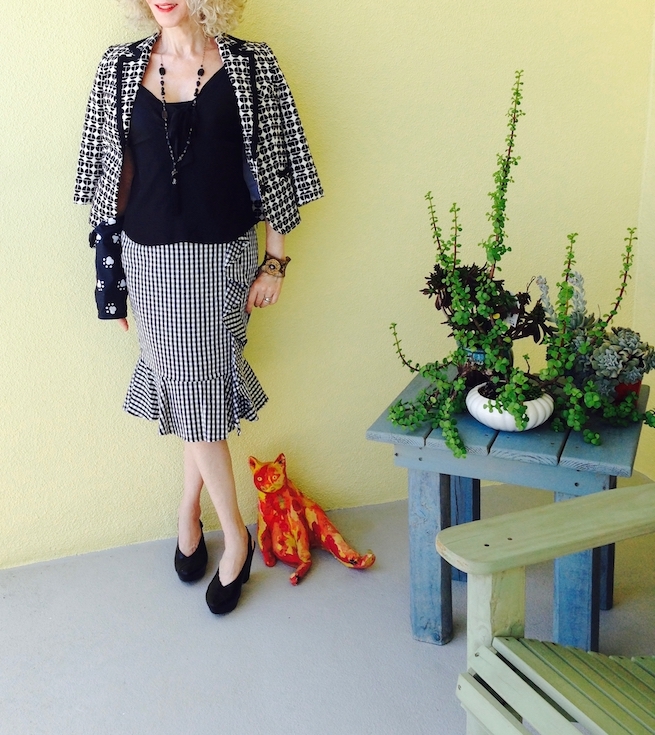 What a gorgeous classy outfit, and yet playful with the funky shoes and doggy print “accessory”! Your trademark, Patti! Lovely hair too, you look utterly fabulous! Love your pattern mixing Patti, and what a beautiful necklace Suzanne made you. Thank you for the link up! Glad you soon will be getting your cast off. This is a gorgeous skirt and I can see why you had to have it! I like the simple styling with the black tank and heels. Oh, this skirt! Patti, it is so darling! I need to go check out how Gail styled it, too. And I love the mix of checks with the jacket (and of course the mix of prints with your doggy print cast cover!) Just perfect! I’ve been seeing that style skirt and I can see why you love it! it is so chic and fun! You look lovely! 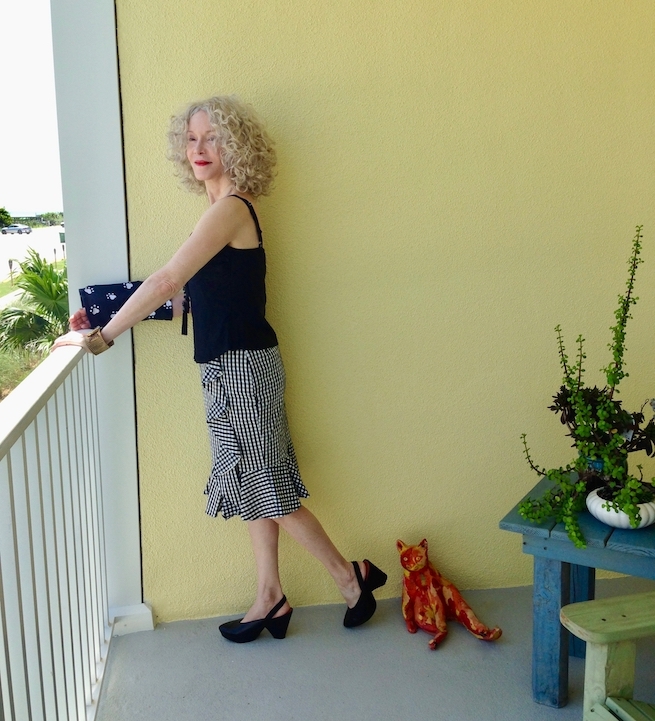 Thanks for the mention Patti – I’ve been looking forward to seeing you in the ruffled gingham skirt! It was probably my best purchase this summer. Looking good in your check combination, love that skirt on you.Glad to hear only two weeks to go until the cast comes off. Many thanks for hosting Visible Monday. Thanks for sharing and hosting the link-up. Love this outfit and I works so well together. Your skirt is so lovely. I love that you wear such a diverse range of styles. Fabulous outfit! That classic jacket is such a ,,want to have,, item! Loving your ruffled skirt and the mixed black & white print and your HAIR!!!!! You look very chic Patti! Love the black and white. I have a similar skirt with large checks. Hello Patti! I am a new participant to the party, and it’s nice to meet you! I love your sprightly checks–the ruffles and curved lines are so pretty, and you wear the outfit with style. I’m glad you’re ready if the temperature drops – I love that jacket/skirt combo. But I love your outfit without the jacket too. Plus all the added love from Suzanne and Bella. Only two more weeks? That’s awesome! I thought it might take months, gulp. So this is great news. This is a great skirt for you, Patti! It looks amazing. Thanks for the link up…have a great week. I’m loving all your pattern play in black and white. Love to see you wearing that necklace again and I appreciate the shout-out. Love, love, love. I, too, have been admiring similar skirts on others but I was never able to find one that I thought suited me. It’s good to see you still flying even with the mangled wing. Soon you’ll be soaring again. Thanks for the inspiration to stay visible no matter the circumstances. That is perfect-I love the skirt too. And I love how the doggie casts add another pattern, but, from experience, I know you are counting the days that you don’t have to have that extra pattern addition!